"Genericide" redirects here. It is not to be confused with Gendercide or Genocide. 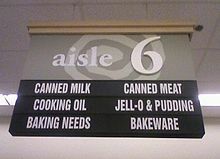 A sign in a supermarket using "Jell-O" generically, rather than "gelatin dessert"
A generic trademark, also known as a genericized trademark or proprietary eponym, is a trademark or brand name that, due to its popularity or significance, has become the generic name for, or synonymous with, a general class of product or service, usually against the intentions of the trademark's holder. The process of a product's name becoming genericized is known as genericide. A trademark is said to become genericized when it begins as a distinctive product identifier but changes in meaning to become generic. This typically happens when the products or services with which the trademark is associated have acquired substantial market dominance or mind share, such that the primary meaning of the genericized trademark becomes the product or service itself rather than an indication of source for the product or service. A trademark thus popularized has its legal protection at risk in some countries such as the United States and United Kingdom, as its intellectual property rights in the trademark may be lost and competitors enabled to use the genericized trademark to describe their similar products, unless the owner of an affected trademark works sufficiently to correct and prevent such broad use. Thermos, Kleenex, Q-Tip, ChapStick, Aspirin, Dumpster, Band-Aid, Velcro, Hoover, Jet Ski, and Speedo are examples of trademarks that have become genericized in the US and elsewhere. The users may not realize that the term is a brand name rather than a medical eponym or generic-etymology term. No alternative generic name for the idea readily comes to mind. Most often, genericization occurs because of heavy advertising that fails to provide an alternative generic name or that uses the trademark in similar fashion to generic terms. Thus, when the Otis Elevator Company advertised that it offered "the latest in elevator and escalator design," it was using the well-known generic term "elevator" and Otis's trademark "Escalator" for moving staircases in the same way. The Trademark Office and the courts concluded that, if Otis used their trademark in that generic way, they could not stop Westinghouse from calling its moving staircases "escalators", and a valuable trademark was lost through genericization. Aspirin for sale in Canada, next to generic store equivalent described as "ASA tablets", since the trademark is still recognized there. The pharmaceutical industry affords some protection from genericization of trade names due to the modern practice of assigning a nonproprietary name for a drug based upon chemical structure. Brand-name drugs have well-known nonproprietary names from the beginning of their commercial existence, even while still under patent, preventing the aforementioned problem of "no alternative generic name for the idea readily coming to mind". For example, even when Abilify was new, its nonproprietary name, Aripiprazole, was well documented. Another example is Warfarin, which was known as an ingredient in rat poison before it was approved for human use under the brand name of Coumadin. Examples of genericization before the modern system of generic drugs include aspirin, introduced to the market in 1897, and heroin, introduced in 1898. Both were originally trademarks of Bayer AG. However, U.S. court rulings in 1918 and 1921 found the terms to be genericized, stating the company's failure to reinforce the brand's connection with their product as the reason. Bayer's involvement in the Great Phenol Plot during World War I, and subsequently the U.S. declaration of war on Germany, were also involved in the case of aspirin and heroin. A different sense of the word genericized in the pharmaceutical industry refers to products whose patent protection has expired. For example, Lipitor was genericized in the U.S. when the first competing generic version was approved by the FDA in November 2011. In this same context, the term genericization refers to the process of a brand drug losing market exclusivity to generics. Trademark erosion, or genericization, is a special case of antonomasia related to trademarks. It happens when a trademark becomes so common that it starts being used as a common name and the original company has failed to prevent such use. Once it has become an appellative, the word cannot be registered any more; this is why companies try hard not to let their trademark become too common, a phenomenon that could otherwise be considered a successful move since it would mean that the company gained an exceptional recognition. Nintendo is an example of a brand that successfully fought trademark erosion, having managed to replace excessive use of its name by the then-neologism game console. Whether or not a mark is popularly identified as genericized, the owner of the mark may still be able to enforce the proprietary rights that attach to the use or registration of the mark, as long as the mark continues to exclusively identify the owner as the commercial origin of the applicable products or services. If the mark does not perform this essential function and it is no longer possible to legally enforce rights in relation to the mark, the mark may have become generic. In many legal systems (e.g., in the United States but not in Germany) a generic mark forms part of the public domain and can be commercially exploited by anyone. Nevertheless, there exists the possibility of a trademark becoming a revocable generic term in German (and European) trademark law. The process by which trademark rights are diminished or lost as a result of common use in the marketplace is known as genericization. This process typically occurs over a period of time in which a mark is not used as a trademark (i.e., where it is not used to exclusively identify the products or services of a particular business), where a mark falls into disuse entirely, or where the trademark owner does not enforce its rights through actions for passing off or trademark infringement. One risk factor that may lead to genericization is the use of a trademark as a verb, plural or possessive, unless the mark itself is possessive or plural (e.g., "Friendly's" restaurants). However, in highly inflected languages, a tradename may have to carry case endings in usage. An example is Finnish, where "Microsoftin" is the genitive case and "Facebookista" is the elative case. Generic use of a trademark presents an inherent risk to the effective enforcement of trademark rights and may ultimately lead to genericization. The legal team of Velcro created a music video highlighting the tragedy of genericide. Trademark owners may take various steps to reduce the risk, including educating businesses and consumers on appropriate trademark use, avoiding use of their marks in a generic manner, and systematically and effectively enforcing their trademark rights. If a trademark is associated with a new invention, the trademark owner may also consider developing a generic term for the product to be used in descriptive contexts, to avoid inappropriate use of the "house" mark. Such a term is called a generic descriptor, and is frequently used immediately after the trademark to provide a description of the product or service. For example, "Kleenex tissues" ("facial tissues" being the generic descriptor) or "Velcro brand fasteners" for Velcro brand name hook-and-loop fasteners. Another common practice among trademark owners is to follow their trademark with the word brand to help define the word as a trademark. Johnson & Johnson changed the lyrics of their Band-Aid television commercial jingle from, "I am stuck on Band-Aids, 'cause Band-Aid's stuck on me" to "I am stuck on Band-Aid brand, 'cause Band-Aid's stuck on me." Google has gone to lengths to prevent this process, discouraging publications from using the term 'googling' in reference to Web searches. In 2006, both the Oxford English Dictionary and the Merriam Webster Collegiate Dictionary struck a balance between acknowledging widespread use of the verb coinage and preserving the particular search engine's association with the coinage, defining google (all lower case, with -le ending) as a verb meaning "use the Google search engine to obtain information on the Internet". Where a trademark is used generically, a trademark owner may need to take aggressive measures to retain exclusive rights to the trademark. Xerox Corporation attempted to prevent the genericization of its core trademark through an extensive public relations campaign advising consumers to "photocopy" instead of "xerox" documents. One example of an active effort to prevent the genericization of a trademark was that of the Lego Company, which printed in manuals in the 1970s and 1980s a request to customers that they call the company's interlocking plastic building blocks "'Lego bricks', 'blocks' or 'toys', and not 'Legos'." While this went largely unheeded, and many children and adults in the U.S. referred to and continue to refer to the pieces as "Legos", use of the deprecated term remained largely confined to the Lego Company's own products – and not, for example, to Tyco's competing and interchangeable product – so genericization of the Lego trademark did not occur. Adobe Systems is working to prevent the genericization of their trademarks, such as Photoshop, but has had mixed success. This is shown via recurring use of the verb "photoshopped", or the shortened version "shopped", throughout the Internet and mass media. Since 2003, the European Union has actively sought to restrict the use of geographical indications by third parties outside the EU by enforcing laws regarding "protected designation of origin". Although a geographical indication for specialty food or drink may be generic, it is not a trademark because it does not serve to identify exclusively a specific commercial enterprise and therefore cannot constitute a genericized trademark. The extension of protection for geographical indications is somewhat controversial. A geographical indication may have been registered as a trademark elsewhere; for example, if "Parma Ham" was part of a trademark registered in Canada by a Canadian manufacturer, then ham manufacturers in Parma, Italy, might be unable to use this name in Canada. Wines (such as Bordeaux, Port and Champagne), cheeses (such as Roquefort, Parmesan, and Feta), Pisco liquor, and Scotch whisky are examples of geographical indications. Compare Russian use of "Шампанское" (= Shampanskoye) for champagne-type wine made in Russia. In the 1990s, the Parma consortium successfully sued the Asda supermarket chain to prevent it using the description "Parma ham" on prosciutto produced in Parma but sliced outside the Parma region. The European Court ruled that pre-packaged ham must be produced, sliced, and packaged in Parma in order to be labeled for sale as "Parma ham". having almost entirely reference to the product or service but capable of becoming "distinctive". ^ "Elliott v. Google, Inc., No. 15-15809 (9th Cir. 2017)". Justia Law. Retrieved 28 November 2017. ^ "Genericized trademark". Marketing Guide. NowSell.com. Archived from the original on 1 February 2013. ^ Fisher, William (n.d.). "Overview of Trademark Law". Harvard Law School. "Under some circumstances, terms that are not originally generic can become generic over time (a process called "genericity"), and thus become unprotected." ^ Hyra, Clifford D. "How Long Does a Trademark Last?". Patents 101. Hyra IP, PLC. Archived from the original on 25 January 2010. ^ King-Seeley Thermos Co. v. Aladdin Indus., Inc. , 321 F.2d 577 (United States Court of Appeals for the Second Circuit 11 July 1963). ^ "U.S. Food and Drug Administration Approves ABILIFY® (aripiprazole) as the First Medication for Add-On Treatment of Major Depressive Disorder (MDD)" (Press release). Bristol-Myers Squibb Company. November 20, 2007. ^ Greenaway, Masa’il; Elbe, Dean (August 2009). "Focus on Aripiprazole: A Review of its use in Child and Adolescent Psychiatry". Journal of the Canadian Academy of Child and Adolescent Psychiatry. Canadian Academy of Child and Adolescent Psychiatry. 18 (3): 250–260. PMC 2732733. PMID 19718428. ^ Lim, Gregory B. (14 December 2017). "Milestone 2: Warfarin: from rat poison to clinical use". Nature Reviews Cardiology. doi:10.1038/nrcardio.2017.172. PMID 29238065. ^ Bayer Co. v. United Drug Co. , 272 F. 505, p.512 (S.D.N.Y 1921) ("Disregarding this, however, it was too late in the autumn of 1915 to reclaim the word which had already passed into the public domain. 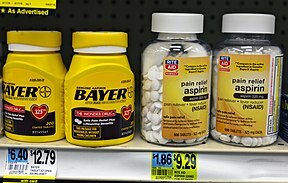 If the consuming public had once learned to know ‘Aspirin’ as the accepted name for the drug, perhaps it is true that an extended course of education might have added to it some proprietary meaning, but it would be very difficult to prove that it had been done in 17 months, and in any case the plaintiff does not try to prove it. [...] Yet, had it not been indifferent to the results of selling to the consumer, it could have protected itself just as well at the time when consumers began to buy directly as in 1915. Nothing would have been easier than to insist that the tablet makers should market the drug in small tin boxes bearing the plaintiff's name, or to take over the sale just as it did later. Instead of this, they allowed the manufacturing chemists to build up this part of the demand without regard to the trade-mark. Having made that bed, they must be content to lie in it. Hence it appears to me that nothing happening between October, 1915, and March, 1917, will serve to turn the word into a trade-mark."). ^ a b c Marsden, Rhodri (10 June 2011). "'Genericide': When brands get too big". The Independent. Retrieved 20 August 2018. ^ "15 Product Trademarks That Have Become Victims Of Genericization". Consumer Reports. Consumer Reports. 19 July 2014. Retrieved 20 August 2018. ^ a b Schofield, John (26 January 2017). "Sometimes a trademark is too 'successful'". The Lawyer's Daily. LexisNexis Canada. Retrieved 20 August 2018. ^ "Generic Trademarks". The Lingua File. 29 November 2012. Archived from the original on 30 August 2017. Retrieved 29 August 2017. ^ "Trademarks and Brands". 3Com Legal. 3Com Corporation. Archived from the original on 10 February 2009. Retrieved 28 March 2010. ^ Microsoft Oy (10 November 2011). "Nokia Lumia 800 ensiesittelyssä Microsoftin Hello Helsinki! -tapahtumassa". Microsoft TechNet (in Finnish). Microsoft. Retrieved 2 January 2013. ^ VELCRO® Brand (25 September 2017). Don't Say Velcro. Retrieved 28 November 2017. ^ Duffy, Jonathan (20 June 2003). "Google calls in the 'language police'". BBC News. British Broadcasting Corporation. Retrieved 20 August 2018. ^ "Google". Merriam-Webster Dictionary. Merriam-Webster, Incorporated. Retrieved 20 August 2018. ^ Carton, Bruce (30 June 2010). "Xerox Ad Pretends We Care About Its Trademark Rights to Term Xerox". Legal Blog Watch. Law.com. Retrieved 20 August 2018. ^ "General trademark guidelines". Adobe. Adobe Systems Incorporated. Retrieved 2 January 2013. ^ Rovamo, Oskari (August 2006). Monopolising Names? The Protection of Geographical Indications in the European Community (PDF) (Pro Gradu). Faculty of Law, Helsinki University. Retrieved 28 March 2010. ^ Owen, Richard; Elliott, Valerie (21 May 2003). "'Barmy' ruling bans Asda from undercutting its Parma ham". The Times. Retrieved 5 October 2009. ^ "Asda slams 'ham-fisted' Parma ruling". BBC News. British Broadcasting Corporation. 20 May 2003. Retrieved 20 August 2018. Room, Adrian (1983). Dictionary of Trade Name Origins. Routledge. ISBN 978-0-7102-0174-4. Look up generic trademark in Wiktionary, the free dictionary.